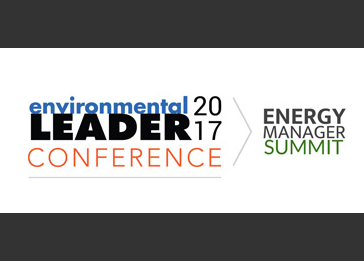 The Environmental Leader Conference 2017, featuring the Energy Manager Summit, will take place on June 5-7, 2017 at the Hyatt Regency Denver Tech Center in Denver, Colorado. It will take a look at what the next four years look like for the business community in terms of regulatory mandates. Early actions taken by Trump indicate he intends to keep his campaign promises to reduce regulations and slash funding for the Environmental Protection Agency. This conference offers a unique opportunity for environmental, sustainability and energy professionals to come together to identify new areas of opportunity to work more collaboratively in addressing their organizations goals. Unlike other conferences, this program unites a group of multidisciplinary, forward-thinking executives to share diverse perspectives and approaches to improving processes and better managing resources. Hear about new ways to tackle the issues, discover innovative technologies, and learn about implementation practices for environmental, sustainability, and energy management goals. Engage with more than 300 decision makers from industrial and commercial corporations that are leading the way. Takeaway actionable steps to improve sustainability performance and reduce negative social and environmental impact. The Energy Manager Summit-an independent conference track tackling the vital issue of energy management and efficiency. Network with leading environmental health and safety, sustainability, and energy management executives. This conference will also host lively discussion with Martha Rudolph, director of environmental programs, Colorado Department of Public Health and Environment and John Jacus, partner, Davis, Graham & Stubbs. They will discuss this radical shift in environmental policy and explore the ways that this will affect you and your business. Scott O’Connell, director of environmental affairs at Dell, will be offering a four-hour workshop on the circular economy — along with Larry Black of McDonough Innovation Sustainability Collaboration and Tom Carpenter of Waste Management..
Click here to view the agenda and speakers. Click here to register.